Donald Trump is a strange man and his statements have caused many to question his competency. More than a few have even called him crazy. 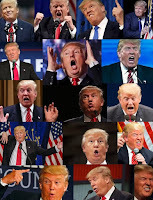 His pathological lying is a matter of record and the question as to whether he is clinically insane is valid, particularly as we stand on the cusp of the possibility that this man may soon be America's commander-and-chief (God help us). In this post we will explore some of the evidence to suggest that Trump may indeed be suffering from a mental illness. He has taken a host of absurd positions the appear ludicrous, not the least of which is his insistence that climate change is caused by the Chinese to destabilize America (apparently he does not know that China is a world leader in clean-tech particularly renewable energy). As loopy as it is, Trump's position on climate change has an explanation that does not necessarily mean he is crazy. As reviewed in these videos, there are psychological reasons why some people deny climate change. Although it does not appear in the Diagnostic and Statistical Manual (SDM) used to diagnosis mental illness, climate denial is highly maladaptive. However, there are other characteristics that Trump exhibits that do appear in the DSM 5. In the following video Trump's behavior is examined in the context of the diagnostic criteria for narcissistic personality disorder. Here is another clinical analysis showing that Trump meets the criteria of a Narcissistic Personality Disorder.